DIE Saturni, 11 die Decembris. Herle to be V. Adm. of the N. of Cornwall. Heads for the Conference on the Irish Petition, and raising Money for the Army. Comp. against Oates, an Anabaptist. Message from the H. C. with Bills for the Royal Assent. Act for settling the Forces by Sea and Land. Message from the H. C. for a Conference on the Ordinance for Tonnage and Poundage. Ordinance concerning the Election of Officers in the City. Act to justify the Proceedings of Parliament. Act concerning the Adjournment of the Houses. Act concerning Peers lately made. Instructions for presenting these Bills to the King. Conference on the Irish Petition, and for raising Money for the Army. Report from the Admiralty Committee, for Herle to be V. Adm. of the N. of Cornwall. and for Relief of Ireland. 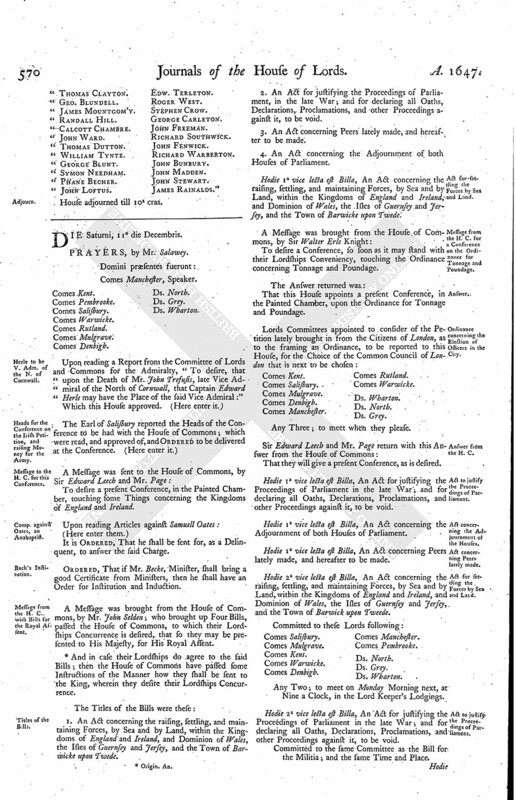 Rutland Ministers Petition against Oates, for Anabaptism, Arminianism, &c.
Upon reading a Report from the Committee of Lords and Commons for the Admiralty, "To desire, that upon the Death of Mr. John Trefusis, late Vice Admiral of the North of Cornwall, that Captain Edward Herle may have the Place of the said Vice Admiral:"
To desire a present Conference, in the Painted Chamber, touching some Things concerning the Kingdoms of England and Ireland. It is Ordered, That he shall be sent for, as a Delinquent, to answer the said Charge. Ordered, That if Mr. Becke, Minister, shall bring a good Certificate from Ministers, then he shall have an Order for Institution and Induction. A Message was brought from the House of Commons, by Mr. John Selden; who brought up Four Bills, passed the House of Commons, to which their Lordships Concurrence is desired, that so they may be presented to His Majesty, for His Royal Assent. * And in case their Lordships do agree to the said Bills; then the House of Commons have passed some Instructions of the Manner how they shall be sent to the King, wherein they desire their Lordships Concurrence. 1. An Act concerning the raising, settling, and maintaining Forces, by Sea and by Land, within the Kingdoms of England and Ireland, and Dominion of Wales, the Isles of Guernsey and Jersey, and the Town of Barwicke upon Twede. 2. An Act for justifying the Proceedings of Parliament, in the late War; and for declaring all Oaths, Declarations, Proclamations, and other Proceedings against it, to be void. 3. An Act concerning Peers lately made, and hereafter to be made. 4. An Act concerning the Adjournment of both Houses of Parliament. Hodie 1 a vice lecta est Billa, An Act concerning the raising, settling, and maintaining Forces, by Sea and by Land, within the Kingdoms of England and Ireland, and Dominion of Wales, the Isles of Guernsey and Jersey, and the Town of Barwicke upon Twede. To desire a Conference, so soon as it may stand with their Lordships Conveniency, touching the Ordinance concerning Tonnage and Poundage. That this House appoints a present Conference, in the Painted Chamber, upon the Ordinance for Tonnage and Poundage. Any Three; to meet when they please. Hodie 1 a vice lecta est Billa, An Act for justifying the Proceedings of Parliament in the late War; and for declaring all Oaths, Declarations, Proclamations, and other Proceedings against it, to be void. Hodie 1 a vice lecta est Billa, An Act concerning the Adjournment of both Houses of Parliament. Hodie 1 a vice lecta est Billa, An Act concerning Peers lately made, and hereafter to be made. Hodie 2 a vice lecta est Billa, An Act concerning the raising, settling, and maintaining Forces, by Sea and by Land, within the Kingdoms of England and Ireland, and Dominion of Wales, the Isles of Guernsey and Jersey, and the Town of Barwick upon Tweede. Any Two; to meet on Monday Morning next, at Nine a Clock, in the Lord Keeper's Lodgings. Hodie 2 a vice lecta est Billa, An Act for justifying the Proceedings of Parliament in the late War; and for declaring all Oaths, Declarations, Proclamations, and other Proceedings against it, to be void. Committed to the same Committee as the Bill for the Militia; and the same Time and Place. Hodie 2 a vice lecta est Billa, An Act concerning Peers lately made, and hereafter to be made. Hodie 2 a vice lecta est Billa, An Act concerning the Adjournment of both Houses of Parliament. Committed to the same Committee as the Bill for the Militia. Next, the Instructions concerning the presenting of the aforesaid Bills to the King were read; and ordered to be committed to the same Committee as the Bill for the Militia. The Lords went to the Conference with the House of Commons; and the House was adjourned during Pleasure. The Conference is ordered to be reported on Monday Morning next. Ordered, That the Cause between Baker and Allen shall be heard on Wednesday next. "Die Martis, 7 Decembris, 1647. "By the Committee of Lords and Commons for the Admiralty and Cinque Ports. "Whereas Mr. John Trefusis, lately Vice Admiral of the North of Cornwall, is deceased, whereby the said Place of Vice Admiral is become vacant; and for that Captain Edward Herle, who raised a Troop of Horse, on his own Charge, in the Beginning of these Troubles, for the Service of the Parliament, and commanded the same ever since, and served as Sheriff of the County of Cornwall for the Year last past, hath been recommended to this Committee, by divers Members thereof, as a very fit Person for holding and executing of the said Place: Ordered, That the said Captain Edward Herle be nominated and presented to both Houses of Parliament, for their approving him to be Vice Admiral of the North of Cornwall, in the room of the said Mr. Trefusis, if they shall so think fit. "That the Three Petitions, (videlicet,) from the Counties of Hertford, Midd. and Bucks, complaining of the Burden of Free Quarter, may be communicated at this Conference; and the House of Commons be desired that some speedy and effectual Course may be taken, by providing Pay for the Army, that so the Countries may be eased of this great Pressure. "That the Army may have Security for their Arrears, by such a Provision as may give them a reasonable Satisfaction. "That the Ordinance for Indemnity may be made full, that they may not be in Danger to be questioned for such Things as they have acted as Soldiers in the Service of the Parliament. 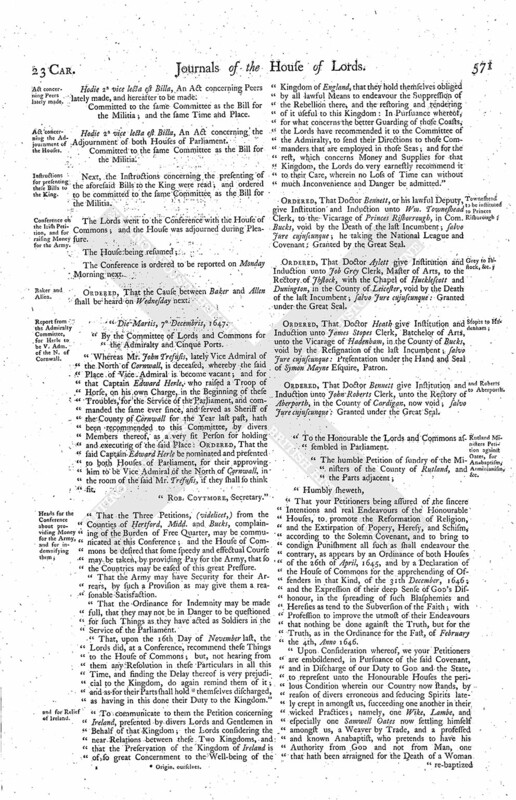 "That, upon the 16th Day of November last, the Lords did, at a Conference, recommend these Things to the House of Commons; but, not hearing from them any Resolution in these Particulars in all this Time, and finding the Delay thereof is very prejudicial to the Kingdom, do again remind them of it; and as for their Parts shall hold * themselves discharged, as having in this done their Duty to the Kingdom." "To communicate to them the Petition concerning Ireland, presented by divers Lords and Gentlemen in Behalf of that Kingdom; the Lords considering the near Relations between these Two Kingdoms, and that the Preservation of the Kingdom of Ireland is of so great Concernment to the Well-being of the Kingdom of England, that they hold themselves obliged by all lawful Means to endeavour the Suppression of the Rebellion there, and the restoring and tendering of it useful to this Kingdom: In Pursuance whereof, for what concerns the better Guarding of those Coasts, the Lords have recommended it to the Committee of the Admiralty, to send their Directions to those Commanders that are employed in those Seas; and for the rest, which concerns Money and Supplies for that Kingdom, the Lords do very earnestly recommend it to their Care, wherein no Loss of Time can without much Inconvenience and Danger be admitted." Ordered, That Doctor Bennett, or his lawful Deputy, give Institution and Induction unto Wm. Towneshead Clerk, to the Vicarage of Princes Risborrough, in Com. Bucks, void by the Death of the last Incumbent; salvo Jure cujuscunque; he taking the National League and Covenant: Granted by the Great Seal. Ordered, That Doctor Aylett give Institution and Induction unto Job Grey Clerk, Master of Arts, to the Rectory of Jbstock, with the Chapel of Hucklescott and Dunington, in the County of Leicester, void by the Death of the last Incumbent; salvo Jure cujuscunque: Granted under the Great Seal. Ordered, That Doctor Heath give Institution and Induction unto James Stopes Clerk, Batchelor of Arts, unto the Vicarage of Hadenham, in the County of Bucks, void by the Resignation of the last Incumbent; salvo Jure cujuscunque: Presentation under the Hand and Seal of Symon Mayne Esquire, Patron. Ordered, That Doctor Bennett give Institution and Induction unto John Roberts Clerk, unto the Rectory of Aberporth, in the County of Cardigan, now void; salvo Jure cujuscunque: Granted under the Great Seal. "To the Honourable the Lords and Commons assembled in Parliament. 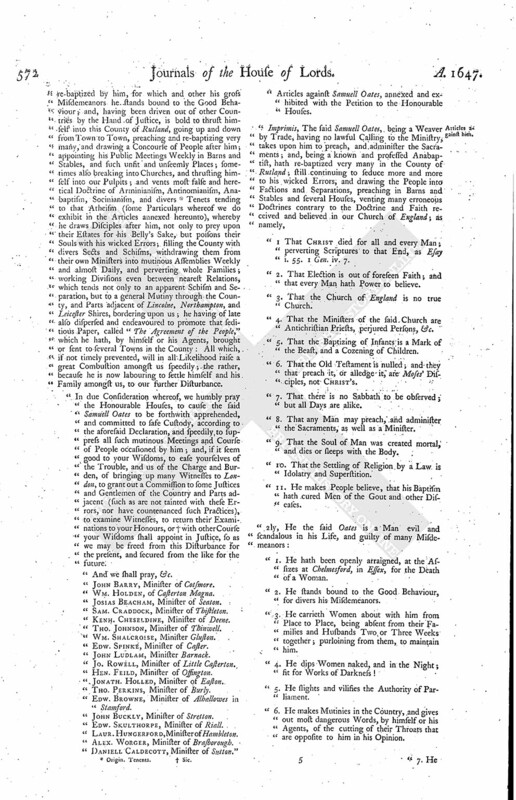 "That your Petitioners being assured of the sincere Intentions and real Endeavours of the Honourable Houses, to promote the Reformation of Religion, and the Extirpation of Popery, Heresy, and Schism, according to the Solemn Covenant, and to bring to condign Punishment all such as shall endeavour the contrary, as appears by an Ordinance of both Houses of the 26th of April, 1645, and by a Declaration of the House of Commons for the apprehending of Offenders in that Kind, of the 31th December, 1646; and the Expression of their deep Sense of God's Dishonour, in the spreading of such Blasphemies and Heresies as tend to the Subversion of the Faith; with Profession to improve the utmost of their Endeavours that nothing be done against the Truth, but for the Truth, as in the Ordinance for the Fast, of February the 4th, Anno 1646. "Upon Consideration whereof, we your Petitioners are emboldened, in Pursuance of the said Covenant, and in Discharge of our Duty to God and the State, to represent unto the Honourable Houses the perilous Condition wherein our Country now stands, by reason of divers erroneous and seducing Spirits lately crept in amongst us, succeeding one another in their wicked Practices; namely, one Wike, Lambe, and especially one Samwell Oates now settling himself amongst us, a Weaver by Trade, and a professed and known Anabaptist, who pretends to have his Authority from God and not from Man, one that hath been arraigned for the Death of a Woman re-baptized by him, for which and other his gross Misdemeanors he stands bound to the Good Behaviour; and, having been driven out of other Countries by the Hand of Justice, is bold to thrust himself into this County of Rutland, going up and down from Town to Town, preaching and re-baptizing very many, and drawing a Concourse of People after him; appointing his Public Meetings Weekly in Barns and Stables, and such unfit and unseemly Places; sometimes also breaking into Churches, and thrusting himself into our Pulpits; and vents most false and heretical Doctrine of Arminianism, Antinomianism, Anabaptism, Socinianism, and divers * Tenets tending to that Atheism (some Particulars whereof we do exhibit in the Articles annexed hereunto), whereby he draws Disciples after him, not only to prey upon their Estates for his Belly's Sake, but poisons their Souls with his wicked Errors; silling the County with divers Sects and Schisms, withdrawing them from their own Ministers into mutinous Assemblies Weekly and almost Daily, and perverting whole Families; working Divisions even between nearest Relations, which tends not only to an apparent Schism and Separation, but to a general Mutiny through the County, and Parts adjacent of Lincolne, Northampton, and Leicester Shires, bordering upon us; he having of late also dispersed and endeavoured to promote that seditious Paper, called "The Agreement of the People," which he hath, by himself or his Agents, brought or sent to several Towns in the County: All which, if not timely prevented, will in all Likelihood raise a great Combustion amongst us speedily; the rather, because he is now labouring to settle himself and his Family amongst us, to our further Disturbance. "In due Consideration whereof, we humbly pray the Honourable Houses, to cause the said Samuell Oates to be forthwith apprehended, and committed to safe Custody, according to the aforesaid Declaration, and speedily to suppress all such mutinous Meetings and Course of People occasioned by him; and, if it seem good to your Wisdoms, to ease yourselves of the Trouble, and us of the Charge and Burden, of bringing up many Witnesses to London, to grant out a Commission to some Justices and Gentlemen of the Country and Parts adjacent (such as are not tainted with these Errors, nor have countenanced such Practices), to examine Witnesses, to return their Examinations to your Honours, or † with other Course your Wisdoms shall appoint in Justice, so as we may be freed from this Disturbance for the present, and secured from the like for the future. "And we shall pray, &c.
"John Barry, Minister of Cotsmore. "Wm. Holden, of Casterton Magna. "Josias Beacham, Minister of Seaton. "Sam. Craddock, Minister of Thistleton. "Kenh. Cheseldine, Minister of Deene. "Tho. Johnson, Minister of Thinwell. "Edw. Spinke, Minister of Caster. "Jo. Rowell, Minister of Little Casterton. "Hen. Feild, Minister of Offington. "Jonath. Holled, Minister of Easton. "Tho. Perkins, Minister of Burly. "Edw. Browne, Minister of Alhallowes in Stamford. "John Buckly, Minister of Stretton. "Edw. Skulthorpe, Minister of Riall. "Laur. Hungerford, Minister of Hambleton. "Alex. Worger, Minister of Brasborough. "Daniell Caldecott, Minister of Sutton." 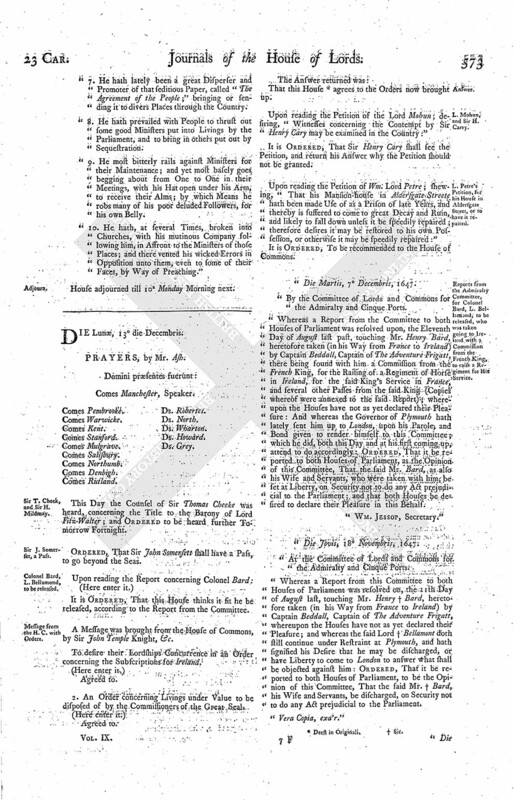 "Articles against Samuell Oates, annexed and exhibited with the Petition to the Honourable Houses. "1 That Christ died for all and every Man; perverting Scriptures to that End, as Esay i. 55. 1 Gen. iv. 7. "2. That Election is out of foreseen Faith; and that every Man hath Power to believe. "3. That the Church of England is no true Church. "4. That the Ministers of the said Church are Antichristian Priests, perjured Persons, &c.
"5. That the Baptizing of Infants is a Mark of the Beast, and a Cozening of Children. "6. That the Old Testament is nulled; and they that preach it, or alledge it, are Moses' Disciples, not Christ's. "7. That there is no Sabbath to be observed; but all Days are alike. "8. That any Man may preach, and administer the Sacraments, as well as a Minister. "9. That the Soul of Man was created mortal, and dies or sleeps with the Body. "10. That the Settling of Religion by a Law is Idolatry and Superstition. "11. He makes People believe, that his Baptism hath cured Men of the Gout and other Diseases. "1. He hath been openly arraigned, at the Assizes at Chelmesford, in Essex, for the Death of a Woman. "2. He stands bound to the Good Behaviour, for divers his Misdemeanors. "3. He carrieth Women about with him from Place to Place, being absent from their Families and Husbands Two or Three Weeks together; purloining from them, to maintain him. "4. He dips Women naked, and in the Night; fit for Works of Darkness! "5. He slights and vilifies the Authority of Parliament. "6. He makes Mutinies in the Country, and gives out most dangerous Words, by himself or his Agents, of the cutting of their Throats that are opposite to him in his Opinion. "7. He hath lately been a great Disperser and Promoter of that seditious Paper, called "The Agreement of the People;" bringing or sending it to divers Places through the Country. "8. He hath prevailed with People to thrust out some good Ministers put into Livings by the Parliament, and to bring in others put out by Sequestration. "9. He most bitterly rails against Ministers for their Maintenance; and yet most basely goes begging about from One to One in their Meetings, with his Hat open under his Arm, to receive their Alms; by which Means he robs many of his poor deluded Followers, for his own Belly. "10. He hath, at several Times, broken into Churches, with his mutinous Company following him, in Affront to the Ministers of those Places; and there vented his wicked Errors in Opposition unto them, even to some of their Faces, by Way of Preaching." House adjourned till 10 a Monday Morning next.